Some leaked photos and specs of the Motorola DROID 2 World Edition have been released and they are certainly interesting at the least. 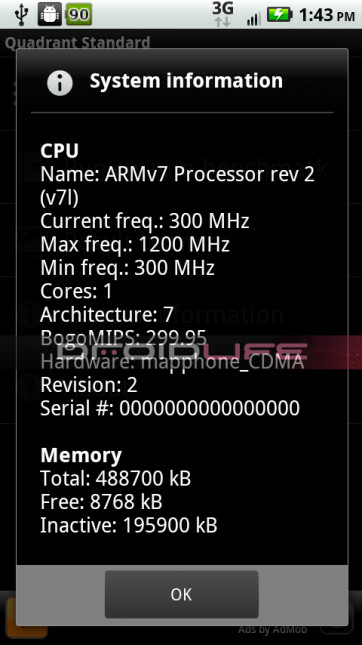 Want to start with the ARM V7 processor with the dial turned all the way to 1.2GHz? Many of the other specs are familiar to those with the DROID X or DROID 2, such as the 3.7 inch screen with a resolution of 480 x 854, a 5MP camera, the version of Blur that is on the DROID X and 2, and the same physical QWERTY from the DROID 2. We would expect the device to be launched with Android 2.2, which of course means Flash Player 10.1 would come pre-installed on the phone. The new processor certainly helps with benchmark scoring as the Quadrant test came in at 1566 and 1709 during an encore. The DROID X with Froyo scored 1431 which shows you the nature of the Beast named Droid 2 World Edition. The Linpack score was 16.499. If you have a need for speed, you might want to seriously consider this your next handset. Unfortunately, no information on launch date and price have been discovered. I installed the official Froyo onto my Droid X at midnight last night. Everything seems to be perfect so far.....EXCEPT for the MARKET. The Market takes FOREVER TO LOAD! I mean FOREVER !!!! Anyone Having this issue? I do like the Video Editing Add on and ofcourse the Flash! What does this comment have anything to do with this article lol. i have 2.2 but don't have that problem. @ChineseMuscle If you're having issues with the update call the Moto Android support line at 800-734-5870. They should be able to help you. My X with Froyo scored a 1378, still edging out the Nexus one with Froyo. HA! Take that! are u still using the euro 2.2 without the JiT? I saw there was new 2.2 test roms out recently.. wonder if any of them have JiT enabled. go to androidforums.com they help lots of people. they have great info and tutorials.